Desperate to keep their movement alive, Orah and Nathaniel cross the ocean to seek the living descendants of the keepmasters' kin. Those they find on the distant shore are both more and less advanced than expected. Be sure to start with the first book in this series, the multiple award-winning The Children of Darkness. And don't miss David's award-winning speculative saga, The Daughter of the Sea and the Sky. This book is even better than the first & I loved it. I wasn't even finished with it when I went looking for book 3! It's inventive, visionary, thought provoking, clean, sensitive..... and so much more. All of the characters come to life before your eyes. You can picture everything perfectly. I can't say enough good things about this series. I recommend it for any age. This is the second in a series.Erin deWard gives a straight forward, plodding narration.It works for this book.Orah and Nathanial finally make it to the land across the sea.It is not what they expect.Instead of a working metropolis, they find it in disrepair.The inhabitants are either part of the mechanical side or the 'green' side.There is a lot of repetition.I was provided this book free by the author, narrator or publisher. Orah and Nathaniel have found their way across the ocean and have found even more people pitted against each other. One advanced and one just beginning their journey. Can Orah and Nathaniel bring the sides together so they can become one, and can Orah and Nathaniel do it before the lose themselves to the dreamers in the never ending dream. This is a great sequel to the first book The Children of Darkness, there is a lot of action, suspense, and so much emotion in this book it will keep you mesmerized until the end. The narrator Erin deWard brought this book to life for the listener as Orah, telling her story for all to hear. She is a awesome narrator making each character unique, I really can't wait for the next book. I have read the first book in the series. The narrator was great as from the first novel. She speaks softly as Orah, which I felt was really in character, but some people may not like. She impresses me with her character voices. When they first met the mentor, for example, she sounds both frail and bursting with excitement, which is perfect for the character. I felt the journey lost a bit of magic from the first story, but perhaps it's because of the characters. Orah and Nathaniel are no longer the naive children who trusted in the temple, and they see the world more realistically now. For example, in the beginning, orah is impressed by the "keep", but soon realizes it's not what she expected. What would have made The Stuff of Stars better? Has The Stuff of Stars turned you off from other books in this genre? No. this is a great genre. The performance seemed slow. I felt like come on put some life into it. The ending was well done. Also I loved the way David brought out the feelings people have for their loved one. What made the experience of listening to The Stuff of Stars the most enjoyable? Erin deWard - her beautiful voice, the wonderful way she read the story. The story is already brilliant, with such wonderful language and dialogue, but the way Erin reads it, plus the fact she has such a beautiful voice herself, makes this ENTIRE series one of the best I have ever listened to. I could easily listen to it again, and happily listen to it when going to sleep as it is so relaxing to listen to at night time, between the fantastic story and Erin's exquisite voice. There are a few to choose from, but Orah's continued search for the Truth, even when faced with so many trials, made me like her so much more. Her character is incredibly beautiful, not just her physical appearance, but in her mind. She is such an intelligent person, with so much passion, courage and strength. Many things, for starters, she has the most beautiful voice of any of the authors I have ever heard. Secondly, she reads incredibly well, very clearly and concisely, so you can understand her easily, without straining at all. She has a fantastic range of character voices, using good male and female voices. She uses decent sound effects as well. I never understand this question? Given that most of these books are greater than 10hrs, and this would make it difficult. This is a wonderful series and a must listen (or read), but with Erin deWard's voice, reading is definitely the 2nd option. Another well written, entertaining. engaging and very enjoyable installment to the seekers trilogy. This installment once again pulls you and weaves a interesting, complex yet simple story. What happens to a world that has become to dependent on technology when that technology and the knowledge to understand/master it is no loner there. Orah and Nathaniel have traveled across the ocean looking for the descendants of the Keepers. What they find is not what they expected. The people Orah and Nathaniel find have divided themselves into separate groups. The Technos, mainly just children who are left, believe in machines. The dreamers, the adult Techno's trapped in dream state. The Greenies, believe in the land and shun technology. Orah and Nathaniel have come seeking help instead they find the people on this side of the ocean need just as much help from them in many ways as they were hoping to find when they started their journey. They find that as with life on their side of the ocean, each group has their own ideas and strictly adherence to their beliefs. They have forgotten that they need each other and the balance that each group brings. They are too busy judging each other to see the value in each group. Missed having the different POV's in this book. Really missed not having more of Thomas in this story. Love the creative and detailed descriptions of their world. Looking forward to the next book in the trilogy. Erin deWard does another great job with the narration. Pleasant voice easy on the ears. Clearly spoken with a smooth even pace. Good singing voice. Good character voices. The narration is very good but struck me as being too soft and soothing for much of the story this time. She almost sounded like she was whispering sometimes. Much softer than in the first book in the series. I do have to say I prefer the narration in the first book better. Would you try another book from David Litwack and/or Erin deWard? 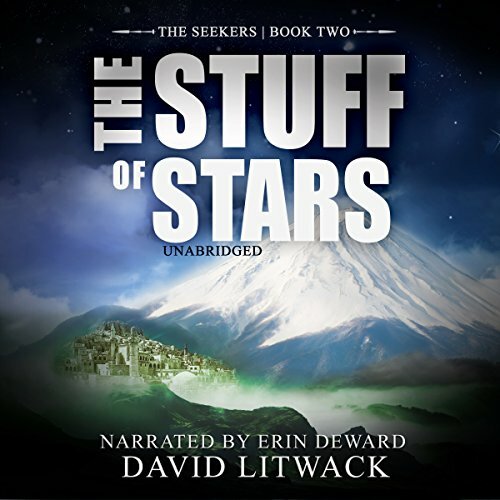 I would listen to another book Erin deWard narrates, but I'm not too sure about another one written by David Litwack. The story here has a similar problem as the first one in the 'Seekers' saga had, that being that the perceived universe is just too small, and everything happens way to conveniently. The two main protagonists cross the ocean after hundreds of years of separation and just happen to crash right next to a settlement of people who are in conflict, and that conflict just happened to happen within a few days of their arrival and perfectly fit into their quest. Would you ever listen to anything by David Litwack again? Not sure, maybe if it is not targeted at a young adult audience who do not care about the plot developing way to conveniently. Do you think The Stuff of Stars needs a follow-up book? Why or why not? This is a great continuation to the series. The book is well written and the narrator did a great job. I can't wait for the next book to come out. The Stuff of the Stars is turning into a great series. Book two felt a lot heavier on the Sci-Fi than book one, because there’s a lot more technology, computers, robots, etc. It makes for an interesting series with book one feeling more like a dystopian future fantasy/Sci-Fi blend, and it makes me wonder where the author will take this series for book three. A lot of the characters were relatable for me, and with the great job that narrator did, I found myself really connecting with the characters. It seems like the narrator did a much better job keeping her speaking pace steady in this book as well. Lastly, she has a fantastic singing voice. I look forward to listening to book three once it’s released.